Are you ignoring a sore or painful jaw? Are you facing the problem of bleeding gums? Are you delaying a dental checkup? If the answer to all of these questions is YES, read on to know how this can affect your cardiovascular health and have the potential to become life threatening. Do not take this lightly. Good dental health may lessen heart risks. Studies have shown that by regular teeth cleaning, you can lessen the risk of heart attack. It is a fact that heart disease is one of the leading causes of death across the world. Research has proved that there is a direct link in between heart disease and gum disease. The human mouth is the home to about 700 types of bacteria. People who are not careful about their oral hygiene tend to get bleeding gums or gum diseases. It has been found that when the bacteria get into the open blood vessels of a bleeding gum, it clings to the blood platelets and may become the cause of partial blockage in the blood flowing to the heart. This increases the risk of adverse cardiovascular conditions like heart attack and strokes. Women are more susceptible to gum diseases, as women face a lot of hormonal changes in different stages of their lives like puberty, pregnancy and menopause. The change in hormone level may trigger sensitive gums, swollen gums or mouth sores. If not cared for properly, this may lead to gum disease. Pregnant women should take extra care. A regular visit to the dentist is recommended. If a gum disease is diagnosed at this stage, pregnant women might have preterm or low birth weight babies. Men develop oral problems more than women. The habit of smoking and tobacco chewing which is very common among men and is the root cause of development of oral diseases like cancer, bleeding gums, etc. It has been seen that men tend to avoid a visit to the dentist and this results in complicated situations where the diseases are detected at a matured state and at times cannot be cured. This can also trigger critical heart conditions and leads to death. It is recommended by dentists that you should floss and brush your teeth twice every day. Too much brushing is also harmful for the teeth as it wears off the enamel of the teeth. Avoid chemical laden tooth pastes which are flooding the market. Use an organic tooth paste, or if you are facing a dental problem then you should use a medicated tooth paste as recommended by your dentist. If you are using dentures you need to be extra careful and keep it clean; as bacteria and plaques grow quickly on dentures which are not kept clean. Start taking care of your teeth from an early age for good dental health. Visit your dentist for a routine checkup once in every 6 months. 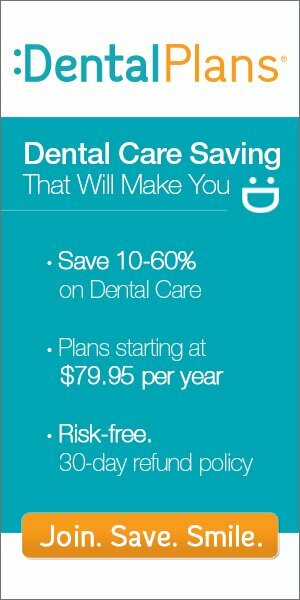 Don’t have any dental coverage, but need to get to a dentist? Click here to see the dental plans we have available in your area.